Between Lima and the southern Peruvian city of Arequipa, there are massive drawings of plants and animals baked into the desert sand. 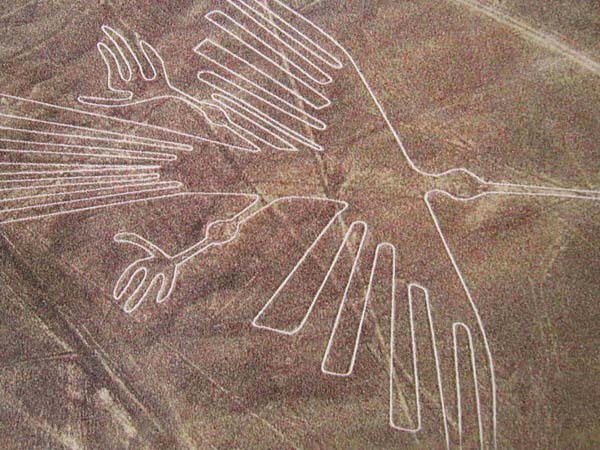 They were carved by the Nazca people hundreds of years ago. They have been studied by archeologists, ethnologists, and anthropologists but an explanation as to why they were created has not been found. These drawings are so large that their shapes cannot be identified from the ground. Not until the dawn of air travel in the 20th Century was any modern human able to discern what is there. This begs the question of who is meant to see these. In the past, we have written about the strange connection ancient civilizations have had with the stars. From buildings aligned with mathematical precision to astral events, to written descriptions of contact with beings on flying vehicles that were considered divine, including in holy books of Christianity and Hinduism. Perhaps the Nazca were in contact with the angels in fiery chariots and were able to look down, or they did not actually do the work. What we see today could very well be an intelligence that attempted to communicate by pictures and reference points as opposed to data signals of today. The first documented crop circle was described in 1678 and early explanations by scientists included patterns forming as a result of storm weather or the work of the devil. Skeptics will point out that at least some of these are formed by hoaxers but we certainly can’t explain them all, particularly those that appear to be incredibly intricate designs that are large in scale and correspond with astral events and/or formations. Perhaps, just as the Nazca created formations of things with which they were familiar, these so-called angels are returning in kind. The formation shown here looks an awful lot like our solar system, with the planets traveling along the concentric circles and even Pluto with its lopsided orbit. Is it possible that when our planets are in the positions shown that something is expected to happen? 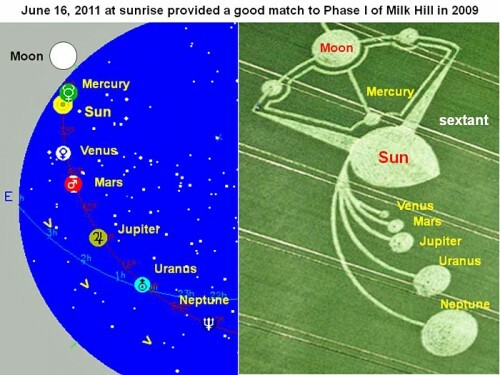 Interestingly enough, the date shown in the crop circle is actually the 2012 end of the Mayan Calendar, though in about 500 years, the planets will return to these position. 2512 A.D. might be the year to watch out for any contact. Could this be a sort of alien RSVP for an upcoming visit? The Search for Extra-Terrestrial Intelligence, “SETI” Institute uses scientific methods in their search for other life in the cosmos. Many of the techniques they use involve radio waves, either sending them or listening for them. So far they’ve had no luck in finding any signals. The likelihood that alien technology resembles that of humans is small. Hunting for a radio signal implies that we are assuming a decent chance that aliens would have coincidentally built similar technology to ours. Perhaps we aren’t finding a signal because they are not sending one by that means. If at least some crop circles are the work of extra-terrestrials, then the Nazca had the right idea in making messages for them on the ground. We shouldn’t necessarily carve them into the rock or bend them into crops, but a large pattern of powerful laser lights shot into space send a loud message of intelligence, especially if we build it in such a way that as the planet rotates, we sweep the entire visible galaxy. We’ve always searched for proof that we are not alone. We can be more proactive in that search and invite a response by several methods, including creating non-natural patterns on the surface of Earth. Perhaps then we can commune with a higher power, as maybe the civilizations of old did. We believe we are all children of the same universe and we need your help in our search for God. The Urantia Book certainly provides the historical background to support the idea of a beneficent celestial administration watching and gently guiding us into a true understanding of our place in the cosmos. The Bible, Gilgamesh, etc. provide snippets of disjointed stories that the Urantia Book fleshes out to give us the largest and most inclusive picture of God’s relationship to humankind ever presented. As a man of open mind i belive that we are children of a higher beings,and as children we should ask questions like:who or what are the Anunnaki? 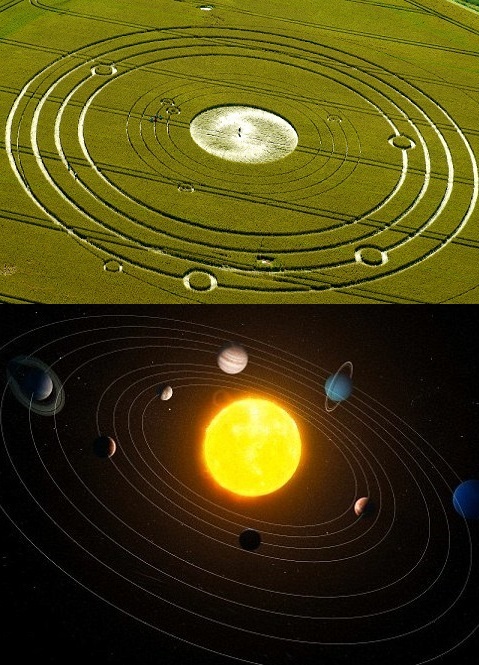 What is the meaning of crop circles? Is life what we have been told? Meny things i fail to understand in a “normal”conceptul manor. Our search for God will end when we begin to know ourselves. Our religions forbid us from knowing ourselves and who we truly are. Any one of us can ask the questions- Who is God? Who am I?. There within lies the answer. All the great masters and teachers have told us the answer but we choose to hear and act on what our religions say. It is all there written down in our Holy Books. It is right there in front of our faces. But we are steered around in a whirlpool, dizzy in our understanding and accepting that we are simply flesh and blood. And only when we die do we receive our rewards. Which depends totally on our understanding of God. Break the circle of restriction. Know thyself. It is commendable to find this information even offered to debate by a religious institution. person and their actions characterized by a sexually abnormal and unacceptable practice or tendency that is based on a truth that is turned into a lame fanatic’s lie “a person filled with excessive and single-minded zeal which is especially used for an extreme religious or political cause.WHICH ARE ALL LIES WITH NO EXCEPTION, SO WE AS PEOPLE MUST GET WITH THE LORD JESUS CHRIST OUR FATHER” THE” FOREVER LOVING FAITHFUL REAL KING OF OUR SALVATION THE ONLY GOD WHO’S JUSTICE IS RIGHT AND FAIR FOR ANY AND ALL MATTERS CONCERNING OUR LIVES !!!!!!! I have noticed that the pictures of the animals in Peru all have a starting and stopping point like an Etch a sketch. Is this some kind of alien toy that made these? Well, the way I see it is the Jews killed Jesus because he practiced witchcraft and sorcery. We heard about the two snakes ( you know, the one where Moses threw down his cane and it became a snake and ate the other one). Ok, lets just forget all about that and think all this other stuff (circles in the sand) came from outer space! I guess it was little green creatures from outer space that parted the sea. O’ wait, Moses did that! People give me a break! God is all mighty. Satan can do some things too, in case you just thought Mosses and Jesus were the only one that could do things that man cannot understand you better get your @##@ together! Because you ain’t seen nothing yet! Sad to see people of different cultures can’t even discuss things without ‘shouting’ (that is what printing in capitals is) at each other. Surely we do not want to go down the road of I.S.? Can we not just discuss a point and part still acquaintances? Is that not what Paul preached? “To the Greeks, I became Greek. To the Romans, a Roman…so that the ‘good news’ can be preached to everyone everywhere”. Love is God’s gift, whatever and however you perceive Him (or Her). Have a good day all. Jim Donald. Do not be afraid or offended by ancient aliens nor theories about them. We know they are not God, but set themselves up as gods or rulers over mankind. Understand the difference between our physical versus spiritual selves- hence our dual nature. 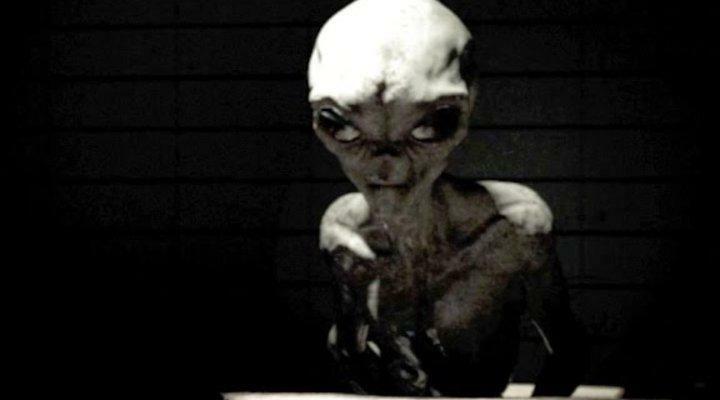 Ancient aliens may have indeed confused our records and religious beliefs by manipulating our genetics and directing us to kill one another to carry out their schemes but the true God is within us. Our greatest teachers Jesus and Buddha told us so. Look not outside yourself for God because He is neither hither nor yonder. Read that in the New Testament! Jesus told us we are of one spirit in communion with him- Buddha said we are all Buddhas but simply don’t know it. Look within and you will find that light. Again, there is the Creation of the spirit which only God can do and the manipulation of physical matter which our own scientists of today can do. We are spiritual beings in physical bodies. One does not exclude the other. As a side note, Sumerian sacred texts confirm mankind existed as a primitive hominid BEFORE the annunaki’s genetic manipulation. We FELL into that state by forgetting who we are and most of us still haven’t figured it out. YE ARE GODS,. Beware of things like “we are all children of this universe” beware of people like “Universal” I can assure you that Universal Church will ordain you in anything you want to worship. we are only humans, religion was made for people to believe in something, to blame someone else for what they did or do, thats why we have so many “so call Religions”, our ancestor (caveman) didn’t have any believes or religions, we just live and die life goes on, we are like flowers we grow we bloom we reproduce , we die….we go back to the dirt, and they cycle start over again.